Muqata’a’s syncopated loops and jagged samples of the sounds of the occupied West Bank are meant to be a disruption, a glitch in the system. 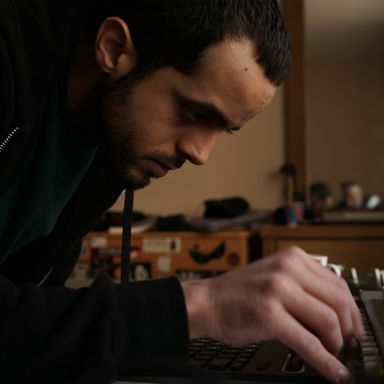 Formerly a member of the acclaimed collective Ramallah Underground and known as the “godfather” of the underground hip-hop scene in Ramallah, Palestine, Muqata’a weaves classical Arab music and found sound into his instrumental hip-hop to speak back to the auditory and physical assault of military checkpoints and Israeli helicopters. You can also find him in a new documentary, Palestine Underground, which follows members of a growing subterranean dance culture as they put on DIY parties across Palestine.